Sometimes 25" just isn't enough to get the job done. In that case, perhaps you need a wide format laminator. MyBinding.com carries a wide selection of wide format machines from GBC, Royal Sovereign, Drytac, Ledco and D&K. These units are ideal for creating signs, banners, posters and for laminating large format inkjet and offset press output. Imagine being able to produce your own high quality laminated documents in minutes. The possibilities are nearly endless. Check out the great features of these wonderful laminating machines and give us a call if you have any questions. Welcome to MyBinding video. Sometimes 25” or 44” is just not enough to get the job done. In that case, maybe you need a wide format laminator. MyBinding.com carries a wide selection of GBC, Royal Sovereign and Drytac wide-format laminators. All of them are ideal for creating signs, banners, posters and for laminating large-format inkjet and offset press output. 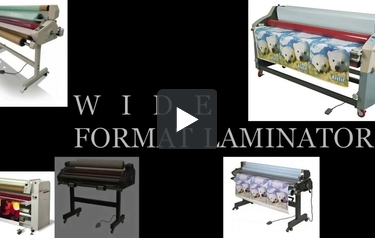 These wide-format laminators allow you to produce your own high-quality laminated documents in minutes. The possibilities are nearly endless. We have a knowledgeable and educated staff on the phone, waiting to answer any questions you have and guide you through your entire purchase. We want to be your source. When image matters, MyBinding.